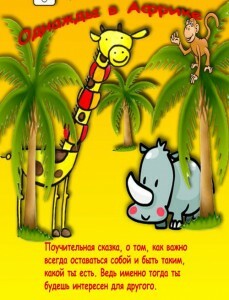 On November 16, at 17.00, “Shalom baby!” family club invites children from 2.5 years of age to come over and enjoy the puppet show “Once in Africa” staged after the play by Gunter Horst “Giraffe and Rhinoceros”. A cautionary tale about how important to always stay yourself and be who you are. After all, that’s when you’ll be of interest to others. Africa!!! Africa!!! It’s very interesting here. In Africa there are many animals. And they are all very different, e.g. a Rhino and a Giraffe … Our story will be about them and about their extraordinary friendship! And, as we know, true friendship cannot be destroyed either by gossip or by intrigue … What will happen to them, and what will be the outcome of our story? – Creative workshop “Creating an African mask”. – For a puppet show – 90 grivna per person. – For a puppet show with the master class – 150 grivna per person. Pre-registration for classes by tel. : 0676109161, 0676711400.